Warm temperate with hot summer climate zones of the world according to a modified Köppen climate classification that uses a threshold of 0°C (32°F) for the coldest month. A humid subtropical climate is a zone of climate characterised by hot, usually humid summers and mild to cool winters. It normally lies on the southeast side of all continents, generally between latitudes 25° and 40°. It tends to be located at coastal or near coastal locations. However, in some cases it extends inland, most notably in China and the United States. The Humid Subtropical climate classification was created in the Trewartha Climate classification. The Trewartha system was a 1966 update of the Köppen climate classification, and sought to redefine middle latitude climates into smaller zones (the original Köppen system grouped all middle latitude climates into a single zone). Under the Trewartha climate classification, climates are termed humid subtropical when they have monthly mean air temperatures higher than 10 °C (50 °F) for eight or more months a year and at least one month with mean temperature below 18 °C (64.4 °F). In most locations classed within this system, the mean temperature of the coldest month is between 3 °C (42 °F) and 18 °C (64.4 °F). The warmest month normally has a mean temperature of 72 F(22 C) or higher. Rainfall often shows a summer peak, especially where monsoons are well developed, as in Southeast Asia. However, other areas tend to have more uniform rainfall. Most summer rainfall occurs during thunderstorms that build up due to the intense surface heating and strong subtropical sun angle. Weak tropical lows that move in from adjacent warm tropical oceans, as well as infrequent tropical storms often contribute to high sun (summer) seasonal rainfall peaks. Winter rainfall is often associated with large storms in the westerlies that have fronts that reach down into subtropical latitudes. However, many subtropical climates such as southeast Asia or Florida have very dry winters, with frequent brush fires and water shortages. In Africa, the humid subtropical climates are found in two separate areas on the southern hemisphere of the continent. The Cwa climate is found over a large portion of the interior of the Middle and Eastern African regions. This area includes; central Angola, northeastern Zimbabwe, the Niassa, Manica and Tete provinces of Mozambique, the southern Congo provinces, southwest Tanzania, and the majority of Malawi, and Zambia. Some lower portions of the Ethiopian Highlands also have this climate. Locations in Asia with a humid subtropical climate differ from those in other continents in that they often have marked seasonal differences in precipitation, if not very dry winters (resulting in a Cwa classification). In East Asia, this climate type is found in the southeastern quarter of mainland China, the northern half of Taiwan,northern Myanmar, northern Vietnam, narrow areas along the coast of South Korea, and Japan (Kyushu, Shikoku and half of Honshu). Cities near the equatorward boundary of this zone include Hong Kong, Hanoi and Taipei while Qingdao is near the northern boundary. The influence of the strong Siberian anticyclone in East Asia brings colder winter temperatures southward, pushing the 0 °C isotherm as far south as the valleys of the Yellow and Wei, roughly latitude 34° N. At Hainan Island and in Taiwan, the climate transitions from subtropical into fully tropical. In most of this region, there is extremely limited precipitation during the winter, owing to the powerful anticyclonic winds from Siberia. Humid subtropical climates can also be found in South Asia, primarily along the Ganges River. However, the humid subtropical climates exhibited here differ markedly from those in East Asia (and for that matter a good portion of the globe). Winters here are typically mild, dry and relatively short. They also tend to be foggy. Summers tend to be long and very hot, starting from mid-April and peaking in May and early June with high temperatures often exceeding 40 °C (104 °F). They also tend to be extremely dry, complete with dust storms, traits usually associated with arid or semi-arid climates. During this period many native trees defoliate to save water. This is followed by the cooler monsoons, where the region experiences heavy rains on almost a daily basis. Average high temperatures decreases during the monsoon season but the humidity increases. This results in hot and humid conditions, similar to summers in other humid subtropical climates. Cities such as New Delhi, Lucknow, Kanpur and Patna exhibit this atypical version of the climate in India. In Pakistan, the twin cities of Rawalpindi/Islamabad also feature this weather pattern, but with wetter and relatively cooler winters. Sialkot is another major city in Pakistan that features a humid subtropical climate. In South Asia, humid subtropical climates generally border on continental climates as altitude increases, or on winter-rainfall climates in western areas of Pakistan (i.e. Peshawar in northwestern Pakistan or Srinagar in the Kashmir Valley in India, where the primary precipitation peak occurs in March, not July or August). Further east, in highland areas with lengthier monsoons such as Nepal, seasonal temperature variation is lower than in the lowlands. Although humid subtropical climates in Asia are mostly confined to the southeastern quarter of the continent, there are areas on the Caspian Sea and Black Sea with humid subtropical climates that are unusually warm for their high latitudes and also unusual for this climate type, that snowfall in winter is relatively common, but is usually of a short duration. Western Georgia (Batumi and Kutaisi) in the Kolkheti Lowland and the north coast of Turkey (Giresun), have a climate similar to that of Gilan and Mazandaran in Iran and very similar to that of southeastern and northern Azerbaijan. Temperatures range from 22 °C in summer to 5 °C in winter and rainfall is even heavier than in Caspian Iran, up to 2,300 millimetres per year in Hopa (Turkey). These climates are a Cfb/Cfa (Oceanic climate/Humid subtropical climate) borderline case. In North America, humid subtropical climates are almost exclusively the domain of the American Gulf and south Atlantic states, including the following states: the eastern half of Texas, Oklahoma, Louisiana, Arkansas, Alabama, Mississippi, Kentucky, North Carolina, South Carolina, Virginia, lower elevations of West Virginia, Tennessee, Georgia, and Florida. On the Florida peninsula, the humid subtropical climate gives way to the tropical climate of south Florida and the Florida Keys. Under Köppen's climate classification, the humid subtropical climate can also be found in the Mid-Atlantic, primarily Maryland, Delaware, Washington, D.C., southeastern Pennsylvania, southern New Jersey and far southern New York, specifically New York City and Long Island. It can also be found in the Midwest, primarily in the central and southern portions of Kansas and Missouri, and far southern portions of Illinois, Indiana and Ohio. Outside of isolated sections of Mexico, the southernmost limits of this climate in North America lie just north of South Florida and around southern coastal Texas. Cities at the southernmost limits, such as Tampa and Orlando and along the Texas coast around Corpus Christi down toward Brownsville generally feature warm weather year round and minimal temperature differences between seasons. In contrast, cities at the northernmost limits of the humid subtropical region (using the Köppen climate classification system) such as Philadelphia and Louisville, Kentucky have average winter temperatures at the coldest limit of climates classed as subtropical. Snowfall varies greatly in this climate zone. In locations at the southern limits of this zone and areas around the Gulf Coast, cities such as Orlando, Tampa, Houston, New Orleans, and Savannah rarely see snowfall, which occurs, at most, a few times per generation. In Southern cities farther north or inland, such as Birmingham, Atlanta, Memphis, Little Rock, Nashville, Dallas, Norfolk, Charlotte, and Raleigh, snow typically falls once or twice a season and is usually three inches or less. However, for the majority of the winter here, temperatures remain above or well above freezing. At the northernmost limits of this zone (according to the Köppen climate classification system), cities such as New York City and Philadelphia typically see snowfall during the winter, with occasional heavy snowstorms. Still, average temperatures during a typical winter hover just above freezing at these locations. Precipitation is plentiful in the humid subtropical climate zone in North America – but with significant variations in terms of wettest/driest months and seasons. Much of the interior South, including Tennessee, Kentucky, and the northern halves of Mississippi and Alabama, tends to have a winter or spring (not summer) precipitation maximum. Closer to the South Atlantic and Gulf coasts, there is a summer maximum, with July or August usually the wettest month – as at Norfolk, Cape Hatteras and Jacksonville, North Carolina, Charleston, South Carolina, Mobile, Alabama and New Orleans. A semblance of a monsoon pattern (dry winters/wet summers) is evident along the Atlantic coast from southern North Carolina (Wilmington, North Carolina area) south to Florida. The seasonal monsoon is much stronger on the Florida peninsula, as most locations in Florida have dry winters and wet summers. In addition, areas in Texas that are slightly inland from the Gulf of Mexico, such as Austin, Texas and San Antonio that border the semi-arid climate zone, generally see a peak of precipitation in May, a drought-like nadir in mid-summer and a secondary, if not equal, precipitation peak in September or October. Districts further south, along South Texas' Gulf Coast (Corpus Christi and Brownsville), typically have a strong September precipitation maximum, and a tendency toward dry conditions in late winter and spring, with March or April often the driest months. Humid subtropical climates are found in a sizable portion of South America. The climate extends over a few states of southern Brazil, including Paraná, into sections of Paraguay, all of Uruguay, and the Río de la Plata region in Argentina. Major cities such as São Paulo, Buenos Aires, Porto Alegre and Montevideo have a humid subtropical climate, generally in the form of hot humid summers and mild to cool winters. These areas, which include the Pampas, generally feature a Cfa climate categorization. The Cwa climate occurs in parts of tropical highlands of São Paulo state, Minas Gerais and near the Andean highland in northwestern Argentina. These highland areas feature summer temperatures that are warm enough to fall outside the subtropical highland climate category. The humid subtropical climate zone predominantly lies in eastern Australia. The coastal strip starts from Mackay, Queensland and it ends at the southern coast of Sydney, where it's surrounded by the oceanic climate (Cfb) to the south (Wollongong) and to the west (Blue Mountains). From Newcastle, just above Sydney, the Cfa zone would extend to inland New South Wales, excluding the highland regions (which have an oceanic climate), stretching towards Dubbo to the northwest and Wagga Wagga to the south, ending at the New South Wales/Victoria border (Albury–Wodonga). To note, these places would have characteristics of the semi-arid and/or Mediterranean climates. Furthermore, the inland Cfa climates generally have drier summers, or at least summers with low humidity. There is usually a distinct summer rainfall maximum that becomes more pronounced moving northwards: in Brisbane the wettest month (February) receives five times the rainfall of the driest (September). Temperatures are very warm to hot but not excessive: the average maximum in February is usually around 29 °C (84 °F) and in July around 21 °C (70 °F). Frosts are extremely rare except at higher elevations, but temperatures over 35˚C (95˚F) are not common on the coast. North of the Cfa climate zone there is a zone centred upon Rockhampton and extending up to the Atherton Tableland of Köppen Cwa climate. This has a very pronounced dry winter with often negligible rainfall between June and October, and winter temperatures generally only slightly below 18 °C, above which one would have a tropical savanna, or Aw, climate. Annual rainfall on the coast can reach as high as 2,000 mm (80 inches) in coastal locations and is generally above 1,000 mm (40 inches). However, because most of the heaviest two- and three-day rainfalls in the world occur in this coastal zone as a result of east coast lows forming to the north of a large high pressure system, there can be great variation in rainfall from year to year. At Lismore in the centre of this zone, the annual rainfall can range from less than 550 mm (22 inches) in 1915 to more than 2,780 mm (110 inches) in 1950. Humid subtropical climates are located in the transitional area between the oceanic, Mediterranean and continental climates in southern Europe, in the areas where summer precipitation and winter temperatures are hard for inclusion in the Mediterranean climate schema. Inland from these areas there are isolated pockets where the climate is borderline subtropical but these zones are usually classed as oceanic or humid continental. Average summer temperatures in areas of Europe with this climate are generally not as hot as most other subtropical zones around the world, but the growing season can be adequately long. The Po Valley, in Northern Italy, including major cities like Milan, Turin, Bologna and Verona, has a humid subtropical climate, featuring hot, humid summers with frequent thunderstorms and moderately dry winters. Places along the shores of Lake Maggiore, Lake Lugano, Lake Como (Como and Verbania in Italy and Lugano in Switzerland) have a humid subtropical climate with a distinctive high amount of rainfall during summer. The coastal areas in the northern half of the Adriatic sea also fall within this climate zone. The cities include Trieste, Venice and Rimini in Italy, Split in Croatia, Koper in Slovenia and Kotor in Montenegro. Other Southern European areas in the Cfa zone include the central valleys of Catalonia (Girona) in Spain, the Garonne Valley (Toulouse) and Rhone Valley (Avignon) in France. Along the Black Sea coast of Bulgaria (Varna), Sochi, Russia and southernmost Ukraine (Yalta) have summers too warm (>22 °C in the warmest month) to qualify as oceanic, no freezing month, and enough summer precipitation and sometimes humid conditions, where they'd be fit to be classed under Cfa. Though they closely border the Humid continental climate zone. All these areas are subject to occasional, in some cases repeated snowfalls and freezes during winter. In the Azores, some islands have this climate, with very mild and rainy winters (> 13 °C) and no snowfall, hot summers (> 22 or 23 °C) but with no dry season during the warmest period, which means that they can be classified neither as oceanic, nor as Mediterranean, but only as humid subtropical climate, as with Corvo Island. 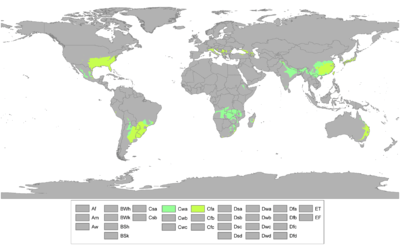 In many other climate classification systems outside of the Köppen, most of these locations would not be included in the humid subtropical grouping. The higher precipitation and high humidity of summers is not present nearly to the degree that it is in subtropical regions of North America and Asia, making its distinction in Europe all the more difficult. ↑ Belda et al. "Climate classification revisited: from Köppen to Trewartha", Clim Res. Vol 59:1-13, 2014. ↑ "Brisbane Regional Office". Climate statistics for Australian locations. Bureau of Meteorology. Retrieved 2 August 2011. ↑ Donohue, R. J., McVicar, T. R., and Roderick, M. L.: Climaterelated trends in Australian vegetation cover as inferred from satellite observations, 1981–2006, Glob. Change Biol., 15, 1025– 1039, 2009.